Many jewelry artist use a design notebook and sketch out their ideas before they start the actual beading. My design notebooks end up with notes about colors I like, supply lists, future shows, or special orders. Designing on paper is very hard for me – I have to see and touch the real materials. 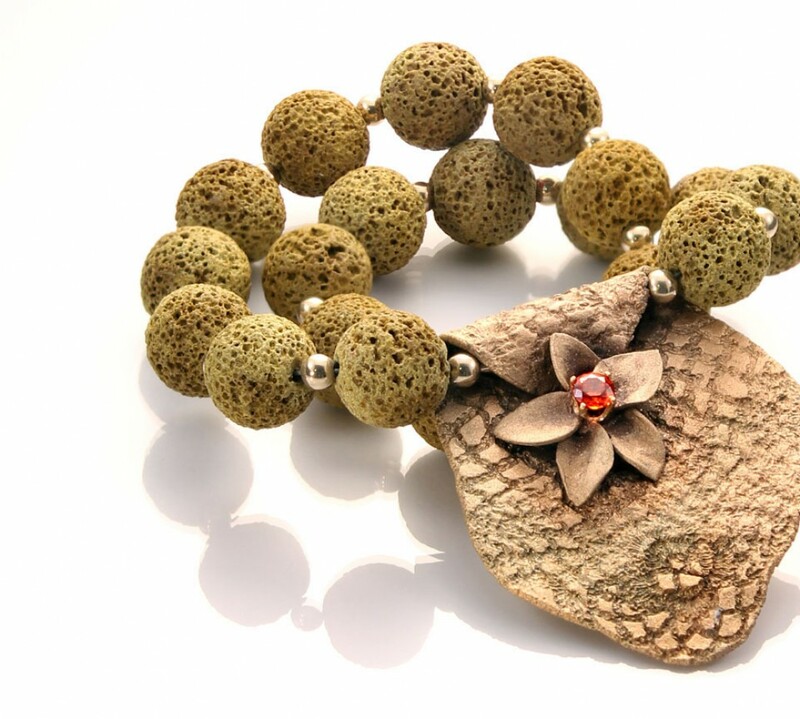 My designs have a tendency to develop as beads meet beads. The official name for this type seed bead stitch is “free form.” Although, I want the balance and pattern, the asymmetrical designs and the eclectic choice of materials pleases me more. 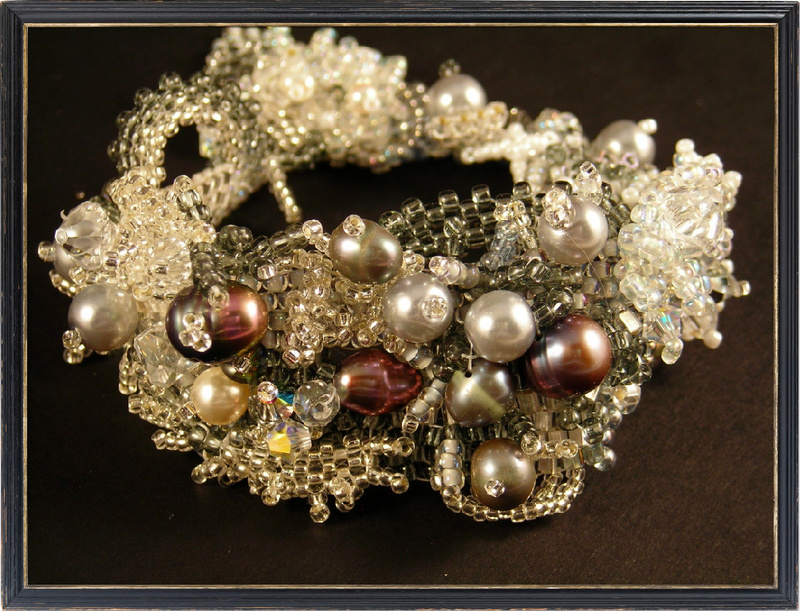 Uniformity in this piece comes from the gray pearls, crystals and seed beads and the clear crystals and seed beads. The final design is just what I wanted – and I only know that when I see it completed and the look feels right. What a beautiful time to visit New Orleans – flowers, low humidity, great temperatures, and long evenings. Our visit was most relaxing and included the usual shopping venues, Magazine Street and French Market and tourist stops, but the highlight for me was the time spent with my daughter and the visit to several bead stores. At The Bead Shop on Magazine Street, we met owner, who was working in the front flower bed, and found lots of beautiful beads inside. The Bead Shop has a great selection of unusual beads and tons and tons of pearls. The store itself, is charming, and a great place to visit especially if you want to design your own jewelry on the spot. They have space for you to work and are very helpful with the technical end. In the French Quarter, we visited the Artist’s Market, where we found some more beautiful blue lace agate, awesome carnelian, locally made lampwork beads and beautiful blue lapis. Well, those are gemstones I bought and only a sampling of what they had in the shop! Among the beads, we enjoyed the gallery’s collection of local artwork , including oil paintings, mosaic tile work sculptures, iron work sculptures, and a little bit of everything. What a treat! It took a morning, but well worth it, to drive up to Ponchatuoula, LA. Lucky for us, it was the week-end of the Ponchatoula Strawberry Festival. Though we missed the major festival events, there were tons of strawberries available, but my favorite was the signature dish at The Berry Patch Gourmet Market, “strawberry beignets” – delightful! 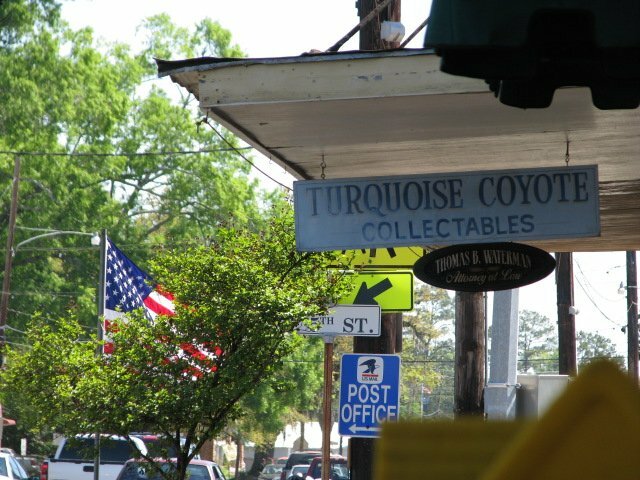 However, our mission was a visit to Turquoise Coyote Bead Shop, which is where we found strands and strands of gorgeous beads, and I’m not talking Mardi Gras beads! They have an awesome selection of beads, everything from Peruvian Pink opal gemstones to Swarovski crystals. I could spend hours and hours in this place. They have everything! Many thanks to Lynn for photo. What a trip! 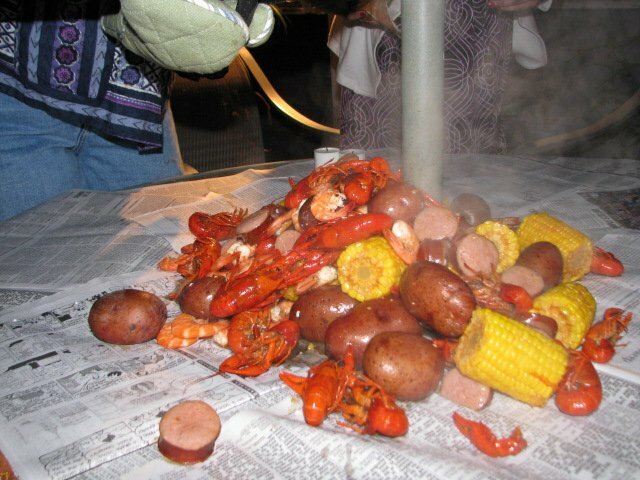 All in all, the highlight of the week was the crawfish boil my daughter planned for us. This was the most perfect evening and the best food in all of NOLA! Again, thank you Lynn for the photo – it pays to carry your own photographer with you on every trip! And thank you Meaghan for another beautiful visit to New Orleans.